The Girard-Perregaux Laureato Collection, which is one of the successful representatives of the luxury sports watch concept that emerged in the early 70's, had its all black ceramic version recently. 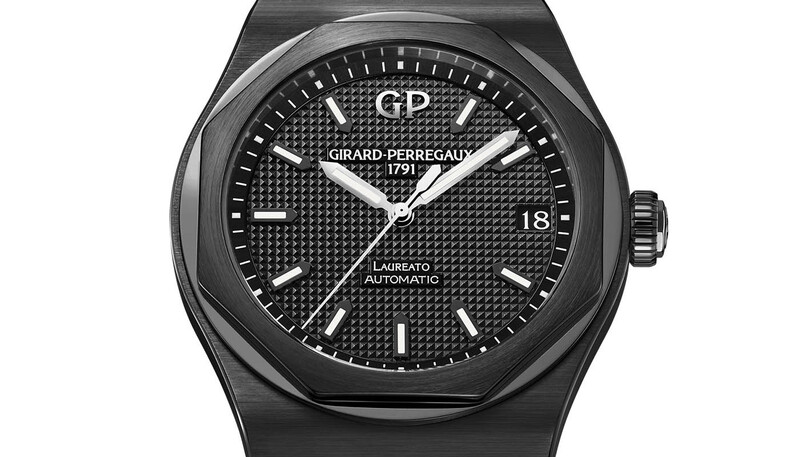 Girard-Perregaux Laureato is actually a very interesting design with a story. 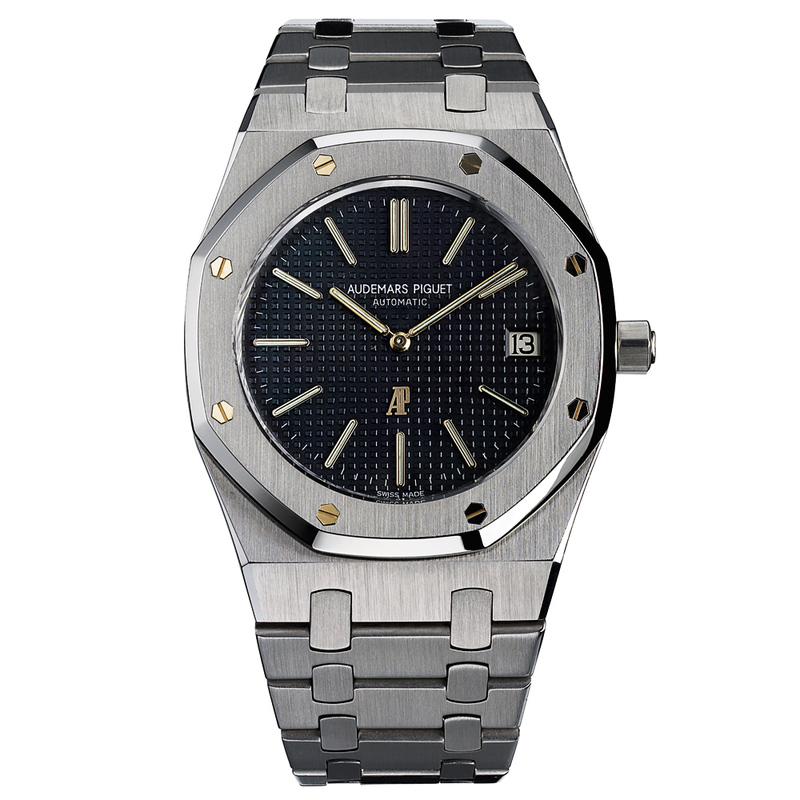 The uniqueness of the model is not that clear as it came out after the introduction of Gerald Genta’s iconic Audemars Piguet Royal Oak. However, it should not be forgotten that in the first years when Laureato shared the showcases with Royal Oak, there were neither Patek Philippe Nautilus nor IWC Ingenieur existed. 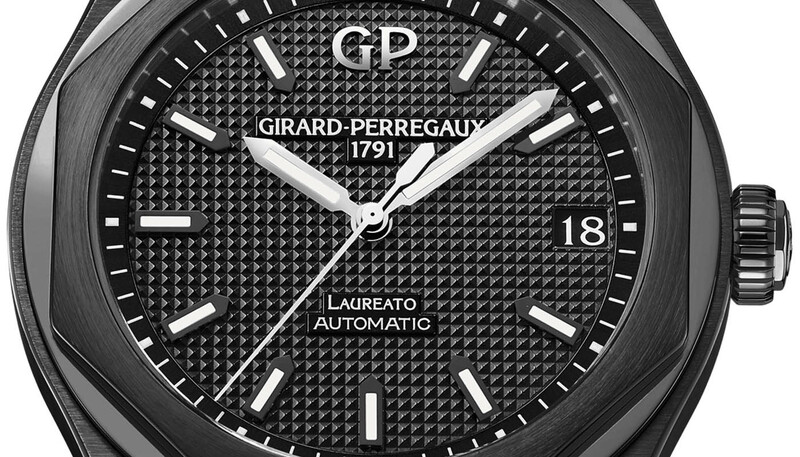 Girard-Perregaux has been braver than the others in its segment in terms of following this new trend which has seemed quite risky at that time. 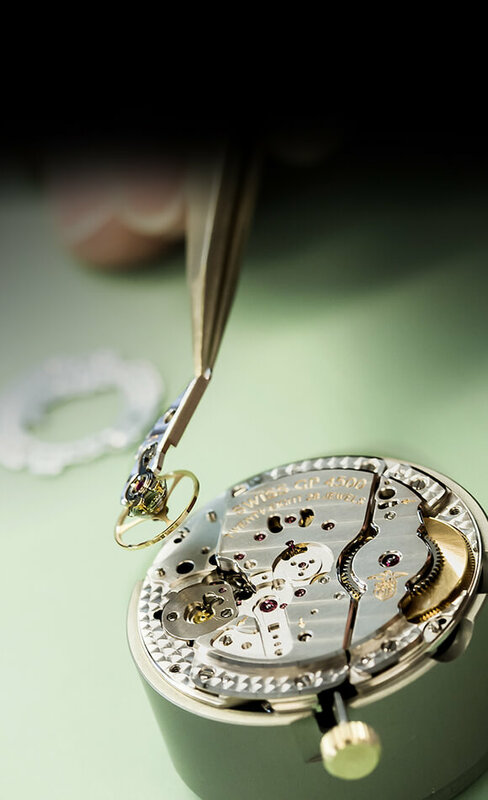 Unlike Patek Philippe, IWC and Vacheron Constantin, Girard-Perregaux managed to do it all by its own, instead of involving Gerald Genta. Even though the result was very successful, the model had its own share of difficulty in terms of existence with several updates and temporarily discontinuations due to the changing trends and demands of the watch industry. In 2016, when the concepts of Heritage and Re-Issue peaked, got re-released once more with a new face that evokes the original model. After the introduction of the Audemars Piguet Royal Oak Black Ceramic, the model became the second black ceramic member of the luxury sports watches group. The case (and all related components) of the new model is made of black ceramic. Measuring 42mm in diameter and 10.9mm in height, the case is water resistant to 100 meters which is in-line with the “sports” part. The case features the signature detail of the model family the octagonal bezel that is also made of black ceramic. Both sides of the case sport AR coated sapphire crystals. The crystal on the caseback is smoked in order to match with the overall black color scheme. The case combines matt and mirror polished surfaces which would surely bring some heat to its stealth look but we better wait to see the model in person rather than commenting on press kit photos. 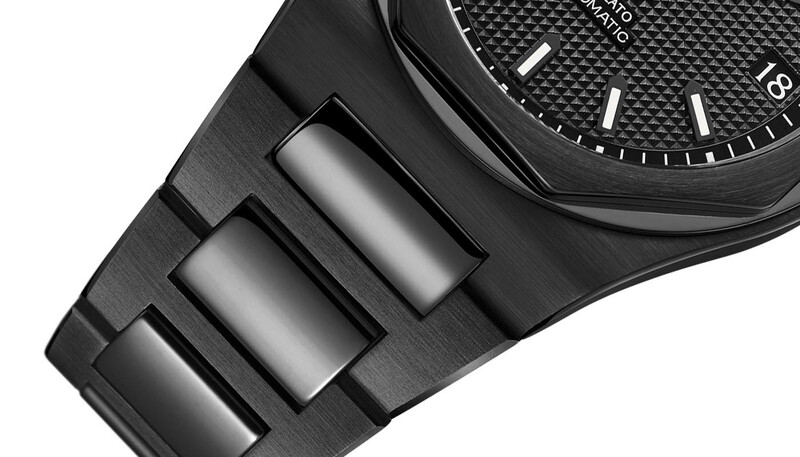 The new model’s dial shares the Laureato Collection’s general design details. The surface of the dial is finished in classic "Clous de Paris Hobnail" pattern. The hands and indices are sword style with SuperLuminova phosphor material filling. 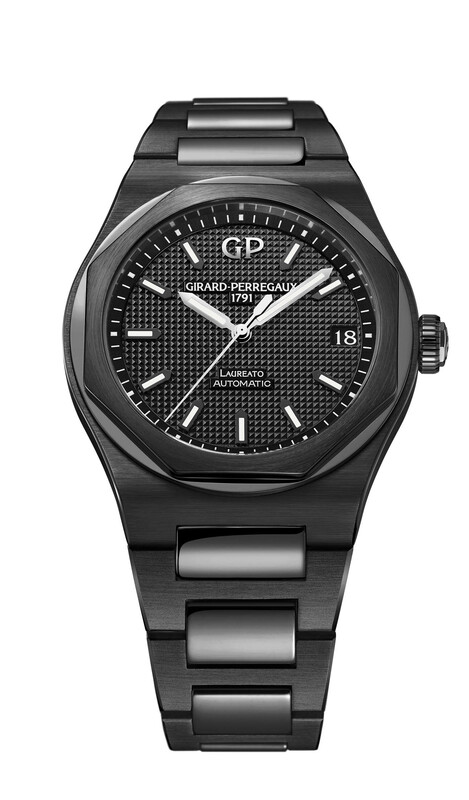 Black is the dial color for the Girard-Perregaux Laureato 42mm Ceramic model. I see that some brands prefer different dial colors in black ceramic or black PVD / DLC coated timepieces. In fact it is a bit weird for me to see a bright blue dial in an all-black model. Of course, there may be some different color accents such as hands or markers but if the main dial color is the subject, “black on black” is my favorite combo. Girard-Perregaux Laureato 42mm Ceramic is a three hand model with a date display located at 3 o’clock. The dial is quite simple with brand logo and additional texts. The model is powered by the brand’s in-house movement Caliber Ref. GP01800-0025. 28 jewels self-winding movement beats at 4Hz and offers a power reserve of 54 hours when fully wound. COSC certified movement can be enjoyed through the smoked sapphire crystal display caseback. The new model’s bracelet is also made of black ceramic. Being mostly identical with the metal bracelets of other Laureato versions, the model’s bracelet bears a couple of nuances which I related to the use of ceramic. First, the folding clasp on the bracelet is wider than the one found in metal bracelets. And the second is about the removable links as the ceramic version’s all links can be removed while the metal ones allow only five links to be removed for size adjustments. Other than these two details that I think are due to the fragile structure of the ceramic, the bracelet is the same as the other models. The players of the luxury sport clock concept have a structure that does not allow much variation, just like the design details that make up the concept. While Audemars Piguet Royal Oak and Patek Philippe Nautilus are confronting this concept as symbol model families, the Girard-Perregaux Laureato and Piaget Polo S collections are taking their place as alternatives that can offer variety without going out of concept. I find this concept extremely successful because, when it comes to my personal preferences, the "classical style" boundaries that my favorite watch types might go for are exactly drawn with these models. I would like to have a luxury sports watch in 18K gold with three hands only (without a date if possible) but if the budget allows a stainless steel model only, I still think that AP RO 15300 stainless steel with blue dial is the best. Personally, I cannot combine the luxury sports watch concept with alternative materials, particularly colored ones. But considering the demand for those models, a black ceramic Nautilus does not seem as impossible as it used to be.